LP: As international students, home away from home, we all really miss our own cultural food! Being from India, I myself really love home food, especially that which I cook myself because it makes me feel much closer to home. 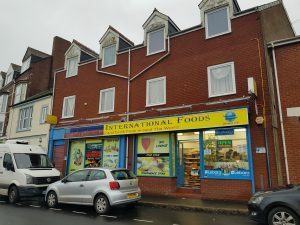 In my quest to find the ingredients for my cooking, I’ve been wandering the streets of Exeter, trying to find the best places to get Indian food. The first place I found was a store called Heera International Foods, on Wells Street. It’s just up the road from the Exeter Mosque. The first time I was there, I felt like I was transported back home! 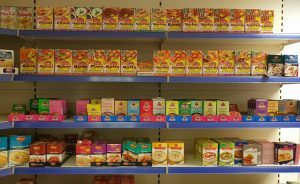 There are all kinds of Indian and Chinese groceries, from spices, pickles, exotic vegetables and ground flours to ready to eat frozen meals! I’m especially a fan of the all the different rice varieties they have there – all the local ones from back home! And it’s all reasonably priced! It’s quite a big store and has everything to make a delicious meal and more! And if you’re in the mood for some ready made samosas or sweets, do drop in! Aleeha: I’m from the Pakistani side of the Punjab, and Heera reminds me of home because the wonderful Sardar ji owners are also Punjabi. They are always friendly and up for conversation, letting me practice my weak Punjabi. My favourite things from Heera (and most Indian grocery stores) are the pre-made spice blends for traditional dishes, like Shaan spice mixes. They make is so much easier to replicate my mum’s cooking without having to measure out and blend my own spices, plus they come with recipe instructions. They are a great option for any novices like me looking to make Indian-Pakistani food. LP : While doing some more wandering, I accidentally found the Best One International store! It’s on Sidwell Street, opposite Tesco Express. This is smaller than Heera but quite well stocked. While you may not get every type of indigenous food, it’s rather cheap. 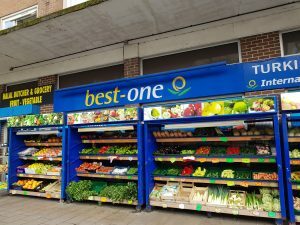 And they’ve got a great selection of fresh vegetables and meat. They’ve got loads and loads of different kinds of spices at very cheap prices so I love going here and getting all kinds of spices! 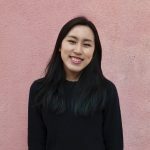 Aleeha: I live quite close to Sidwell Street and make regular stops there for groceries. Best One is one of my favourite places to go to. I love their selection of fresh herbs, turkish cheeses, and middle eastern and south asian breads like naans, parathas, and rotis. All of which are pre-made, so perfect for time-stricken students like myself. Bonus tip: Best One sells Halal food for anyone who eats Halal. 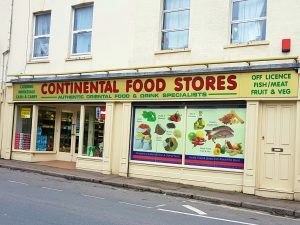 Aleeha: A little further on from Sidwell Street, at the beginning of Old Tiverton Road, is Continental Food Stores. This little grocery store is a spice haven- and for me the best part is, it smells like home. 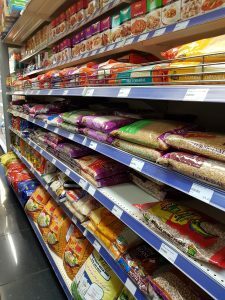 They have a large stock of dried goods at reasonable prices, so they are perfect for bulk-buying rice, lentils, or wheat. (fair warning: pre-arrange how to transport things back home if you buy in bulk). LP: Exeter’s multicultural heritage means that we’re never hard pressed to find world foods! Anything you need from anywhere around the world, chances are you’ll find more than one shop selling it. 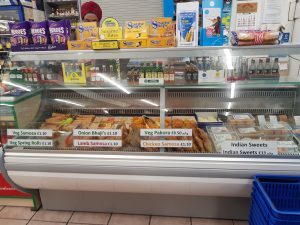 These are a few of the South Asian shops for us fans of the the food from there, all located near the High Street. So perfect for us to find our own slice of heavenly home food right here at Exeter!